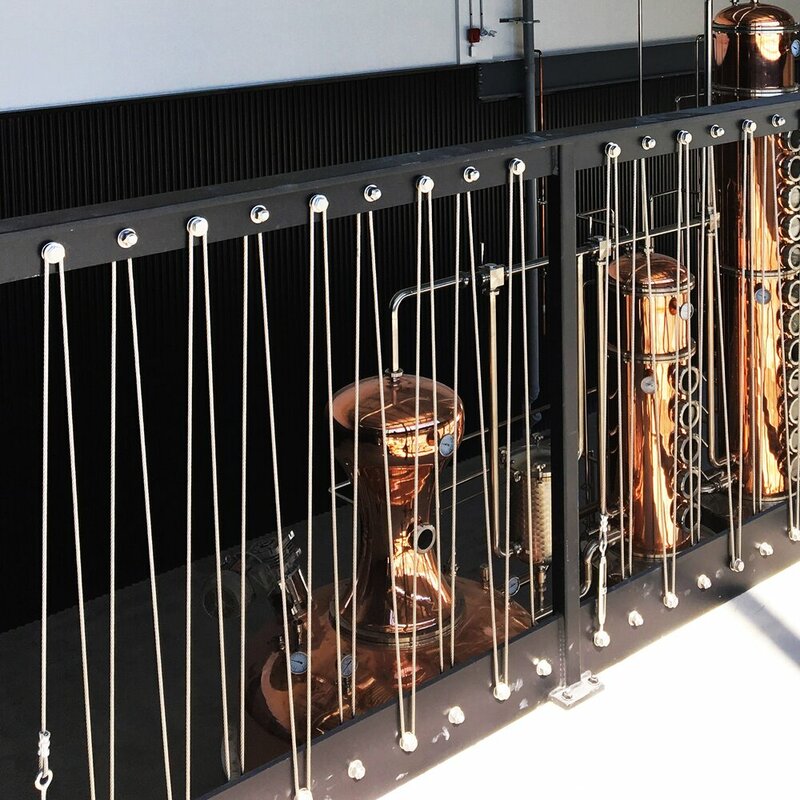 Artist in Residence is an ultramodern artisanal microdistillery located in Gatineau, Quebec. A.i.R Distillerie is the first micro-distillery in the Outaouais region, with one of the largest artisanal production capacities in the country. Their vision is ambitious: to bring regional talent to both, the local and international market, by highlighting the work of local farmers, entrepreneurs and artists through collaborations and business partnerships. Artist in Residence (AIR) is a sleek 15,000-square-foot distillery and company HQ set in an unassuming industrial park in the shadow of the Gatineau-Ottawa Executive Airport. The look and location are at once incongruous and so very logical. Founder Pierre Mantha’s modern micro-distillery sits next to a springwater source and near the very cornfields that supply the grain to his distillery. Mantha was determined that the distillery building be used to frame AIR’s story — free-spirited and unconventional. To tie all his ideas together, he brought in designer Kayla Pongrac of Iron and Ivory. 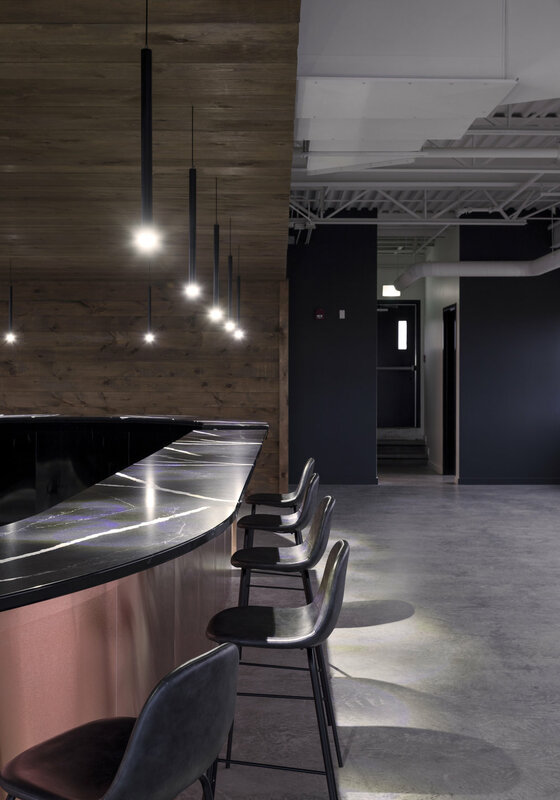 Light and bright, the three-storey space she has imagined encompasses Mantha’s vision while also welcoming the visitor and referencing the distillery’s utilitarian nature. On the main floor, a full wall of windows ensures that light streams in and the copper stills glow, their lustre accentuated against a backdrop of black corrugated steel. Above that backdrop is a plain white wall. When time permits, it will be adorned with black graffiti-inspired art telling the story of AIR’s various brands. In the third-floor showroom, Pongrac mirrors the sensuous curves and colours of the stills with an expansive copper-clad bar that invites tasters to grab a seat and stay awhile. Here, again, there is an industrial vibe, but one that has been warmed and made more inviting. Yes, there’s that concrete floor again, an exposed ceiling, and black metal bases on the lounge chairs. But each of these elements is subtly warmer now — the floor polished to a high sheen, the ceiling featuring suspended wooden boards and hanging ivy, the chairs upholstered in a rich emerald green. Industry meets luxury.